Install the ELM327 OBD2 software package of your choice. Connect the ELM Interface to your computer and allow the drivers to automatically install. Make sure your computer is connected to the internet and your computer is allowed to download new drivers. If the drivers fail to install, attempt to install the drivers manually. Identify the COM-Port associated to the device in the Device Manager. Consider opening the device manager before you plug in the OBD-II adapter so you can see the item added to the device list in real-time. Start your vehicle or have the ignition switch on with power to the battery. Connect your ELM327 Interface to the OBD-II adapter in your vehicle. 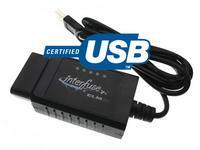 The OBDII plug is normally located under the steering column; No tools are required to locate it. If you are having trouble, keep in mind that it is no further than 3 feet away from the driver. Open the OBD-II software and connect to the interface by selecting the COM-Port associated to the device. If the COM-Port is set higher than the software allows, you will need to change the COM-Port in the Device Manager by right clicking on properties. More information about this is provided in our Comprehensive ELM327 Guide. If the software fails to connect to the interface, un-install it from the Device Manger and reinstall the drivers by plugging in back in. Go online and connect to the vehicles ECU. Trouble codes and real-time data should now be available to you.